Matt Richardson's "Descriptive Camera" doesn't take pictures, not even blurry ones. But it works just fine. Rather than capturing an image on film, Richardson's invention (a prototype built for a Computational Cameras class at New York University‘s Interactive Telecommunications Program) prints out a descriptive bit of text about the photo. After an photograph is taken, the image is sent to Amazon's Mechanical Turk, a service that pays humans to do tasks that computers cannot solve, like translating into words what is captured in a photograph. 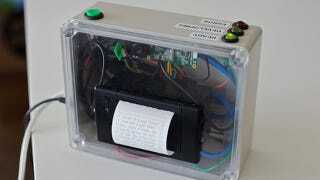 The camera uses a BeagleBone, a tiny Linux computer used in hardware prototypes, and once the transcription has been returned, a thermal printer spits out the resulting text, with a turnaround time—from shutter-click to ink on paper—of between 3 and 6 minutes. Richardson, a photographer and programmer, has had people suggest to him that the Descriptive Camera could be developed into a good product for the visually impaired. He also sees potential in the idea of a device that can catalog all the images we snap on our digital cameras and smartphones. Snap a picture outside of a building in New York City and you'll get this printout from the camera: "This is a faded picture of a dilapidated building. It seems to be run down and in the need of repairs."